A few months ago, we were asking “Where did the 5K RTBs go?” Well good news is they’re back. But with investors and the system awash with cash and liquidity, don’t be surprised if they run out too quickly. Here’s an investment option for you to consider. A good starter for beginners in the investment world, those with only a little amount to invest, and for those looking to diversify or to park extra cash with rates higher than the usual bank time deposits. Considered as among the investments with lowest risks since the government is the one borrowing money, risk of default is next to nil, and in the unlikely event that PH government is bankrupt, it can just print money to repay you (but of course the value of that money will be an entirely different story). Inquire with your preferred bank or fund house. 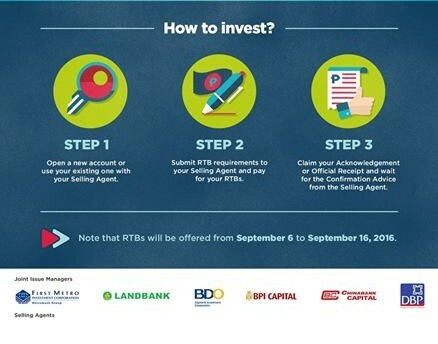 Authorized selling agencies are BDO, BDO Capital, BPI, Chinabank, Citibank, DBP, EastWest Bank, First Metro Investments, ING Bank, Landbank, Metrobank, PBCom, RCBC, Robinsons Bank and Security Bank. Share this article to a friend whom you think will benefit as well. Want to get more updates on investment options? Subscribe to our growing mailing list for free. Follow us on Facebook, Instagram and Twitter. Join me as well in Truly Rich Club, and together, let us enjoy the many financial and spiritual benefits. Last but not the least, sign-up for our free email subscription! May we all have a richer life! Next: Next post: How to Invest the S.M.A.R.T. Way? net interest is only 2.8%…ang liit. Yes you're correct. Quite small especially for those who are comfortable with higher return (yet higher risk) investments. But for those who only have bank deposits as savings, this is slightly better.